Georg Jensen Beak Thermo Jar Black, Tall and stately, it observes the world – or the world of the table, with the pride of an Emperor Penguin, it’s inspirational. Its rounded form is aerodynamic and elegant. Its unique shape combines fullness and angularity, giving it an immediately identifiable silhouette that stands out when used as part of a table setting, an attractive way to serve hot or cold liquids. 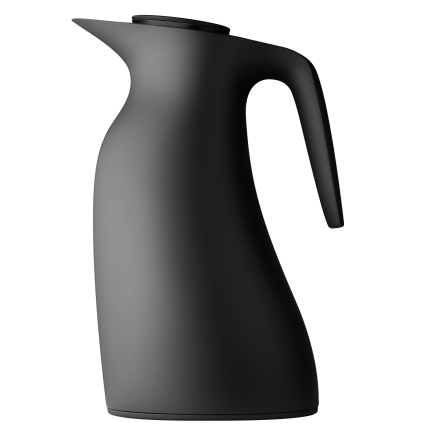 Beak’s fine organic design provides serious functionality and every aspect of the jug and pitcher is expertly designed for maximum ease of use. Its pouring system minimizes drips and spills, and a push-button feature optimizes liquid flow.